I woke up it to snowing this morning. After a night of not much sleep and several days of stress with a kid with the flu, it was the last thing I wanted to see. So I took some advice and made some homemade bread and soup. Cold weather screams homemade bread to me for some reason. And there isn’t much better in this world than a grilled cheese sandwich on homemade bread. This bread is quickly becoming my go to. 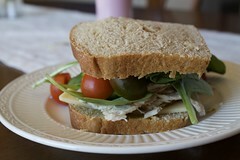 It sounds a bit odd for sandwiches, but I promise it works. I’ve made it with and without the cinnamon. I think I may slightly prefer it without cinnamon, but it isn’t an overpowering flavor when you use it. 1. Combine water through cinnamon in large mixing bowl. Cool to lukewarm (no more than 120 degrees F). 2. Add the yeast and flour, stirring to form a rough dough. Knead with a dough hook for 7 minutes or by hand for 10 minutes; knead until dough is smooth an satiny. 3. Lightly grease bowl. Place dough in bowl. Cover with a light towel or lightly greased plastic wrap. Let rise for 1 hour, about double in bulk. 4. Divide dough in half and shape into a loaf. Place in lightly greased loaf pans. Cover pans with towel or plastic wrap as above. Allow loaves to rise until they crown 1 inch over the rim of the pan, about 1 hour. 5. Preheat oven to 350. Bake for 35-40 minutes, or until golden brown. Immediately remove loaves to wire rack to completely cool. 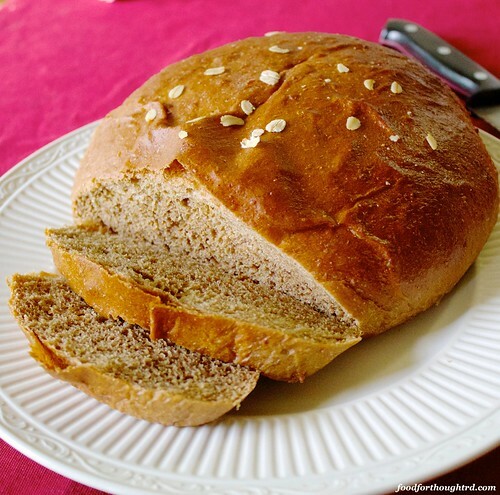 Recipe notes: I have only made this with white whole wheat flour. If using “regular” whole wheat flour, I would probably split it with all-purpose. 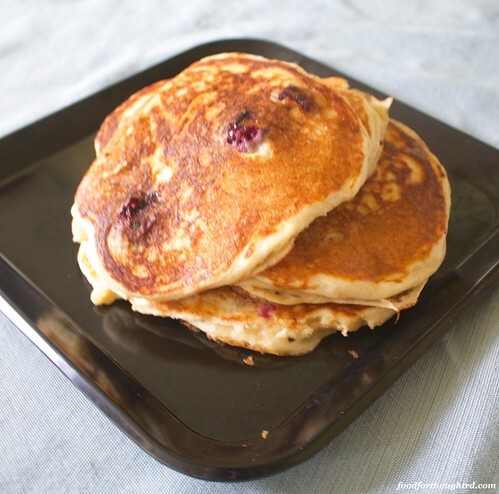 The original recipe called for 1 ½ cups whole wheat flour, 4 cups all-purpose. I’ve had no problems just using 100% white whole wheat flour. A year and a half ago, I visited my in-laws. My mother-in-law was on a very strict low carb diet at the time. The day before I arrived, however, she had a bit of a fall out with her diet. 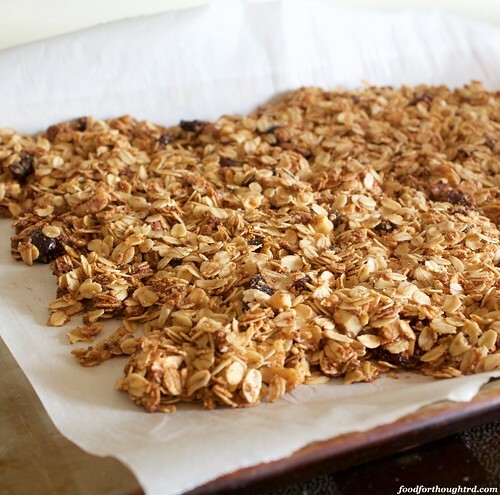 Now, while most of us would go for cake and cookies and ice cream, she made granola. I gave her props for at least caving for something whole grain and mostly good for you. That story is to try and give you some indication of how good this granola is. Good enough to blow a diet for, rather than all the normal sugary stuff. And it really is pretty good for you. Granola only gets a bad rap because we tend to eat A LOT at one time, which can add up in the calorie department. But a little as a snack or on some yogurt is perfect. Enjoy some today on this beautiful first day of fall! 1. Preheat oven to 300. Line a baking sheet with parchment or a silicone liner, or spray with cooking spray. 2. Mix all the ingredients together with a rubber scraper or wooden spoon. Spread in an even layer on baking sheet. 3. Bake for about 30 minutes (keep an eye on it so it doesn’t start to burn). Remove from oven and let it cool for 30 minutes. Break into chunks as desired. Store in an airtight container. Recipe notes: I never have coconut, so I leave that out. You could sub coconut oil in for flavor, but realize that it will change the fat ratios. I like walnuts and craisins. You could use whatever dried fruit and nut combo you like. Or you could use some premixed trail mix if you have that around. I waxed so philosophical about hating recipes that only use part of a can of pumpkin. Yet, I frequently find myself making them anyway. Oops. But I’m getting more creative in ways to use up the extra pumpkin. 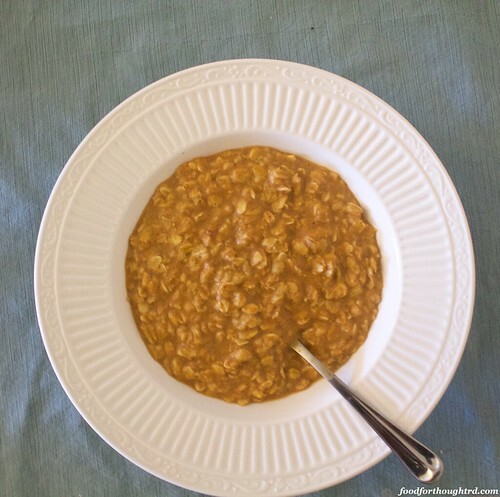 Pumpkin in oatmeal seems like a logical choice. 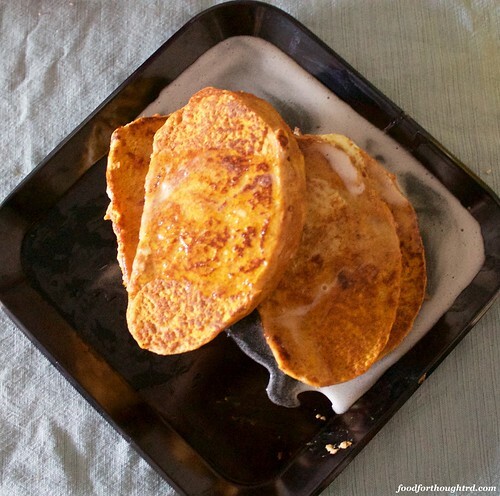 You already put in brown sugar and cinnamon, which go great with pumpkin. Plus you are now putting vegetables in breakfast. That is always a win. 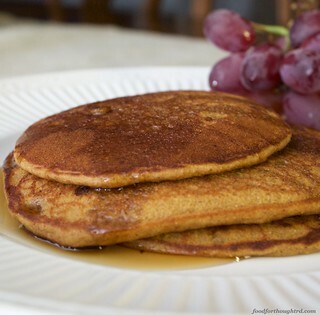 Super fast breakfast that is good for you and delicious. Major win this time of year! 1. Combine all the ingredients in a saucepan over medium heat. Bring to a boil, then simmer for 5-7 minutes, per package instructions for your oats. Stir frequently. Recipe notes: This is a very flexible recipe. Use more or less pumpkin, per your taste. You could use all milk, all water, etc. As for the sugar, I usually add about ¼ cup sugar to my regular oatmeal. I found the pumpkin had a strong taste that needed a little more sugar. You might start with ¼ cup, then add teaspoons in individual bowls for each person’s taste.